This time, we’re giving away one Half Moon Affinity pool, delivered to your door, direct from Blagdon. That’s £439.99 of glorious pond for the sake of writing down a few words. How can you possibly not take us up on that? To be in with a chance of winning this great prize, all you have to do is complete the following sentence in 20 words or less. If it makes me laugh, cry, gasp, or think about calling the police, then it’s in with a chance. "I think you should send me the Blagdon Affinity Half Moon and not let Nathan keep it because…"
You’ve got 20 more words to play with. Make them count. What’s an Affinity pool, and why do I want one anyway? If you have to ask this then it suggests you’ve been stuck in a cave, in a sensory deprivation tank, on some distant planet without radio contact for the last year. The Affinity is the smartest self-contained pool we’ve seen as an off-the-shelf, standalone product. 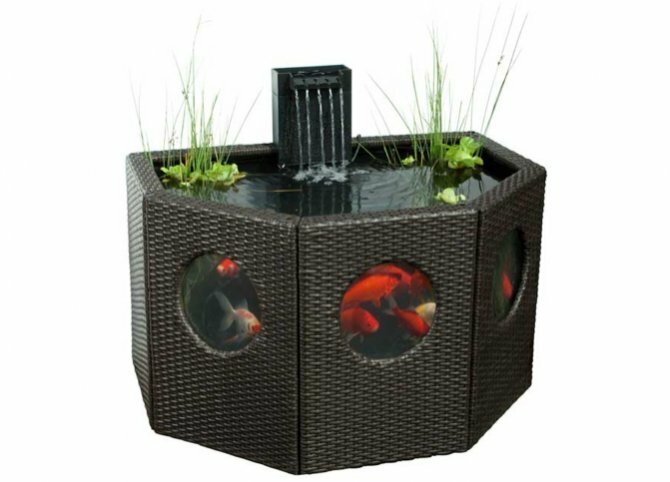 Yeah, there’s probably some pond guru out in the world that put something similar together using diamond windows and eagle-beak inlay, and with filters designed by Ferrari, but I haven’t seen it. This is a complete package. You get the PE Rattan panels that screw together. You get the windows. You get the reinforced liner to keep the water in it. You get the funky little waterfall that sits on top, connected up to the all-in-one pump and filter. You get the LED spotlights for a snazzy night time effect. You even get the tap water conditioner, the green water treatment and the planting basket. The only thing we’re not giving you is the fish to put inside it. We’re pretty sure that you can source your own. The only trick is to not go mad with quantities, seeing as you have 450 l of volume to play with. So the deal is, one entry per person. Email your entries to: nathan.hill@bauermedia.co.uk and we’ll be choosing our favourites from there. We’ll publish a few of the ones that tickle us as and when they come in. Don’t enter if you don’t want your name published in the mag or on the website, because if you win, it’s going up. You’ve got one week from today to get something to us, and any entries received after mid-day on Friday, September 30 will be disregarded. Because that’s when I’ll be doing the final judging and announcing the winner. Just before lunch. And it’s fish and chip day on Fridays at the Bauer office, so I’m not making any exceptions.